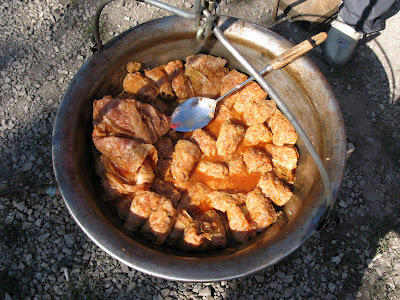 In Hungary the stuffed cabbage is a typical feast (or rather christmas) food and the main dish of the feast on pig-killing day (disznótor). 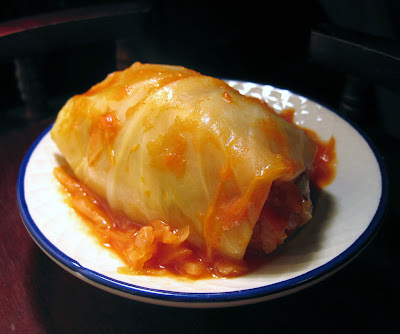 Probably our stuffed cabbage is originated from szárma, that means the stuffed grape leavs roll, which is originated from the time of the Ottoman (Turkish) occupation. I guess stuffed cabbage is wellknown and popular savyour food in many parts of Europe and Western Asia, but made differently everywhere. Many years ago (during high school) I spent a summer in Israel and there I tasted the kosher variety without smoked pork and sour cream. 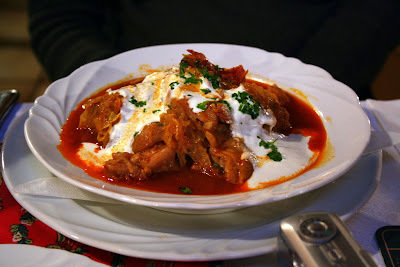 To be honest I could never be a kosher, because the stuffed cabbage is only good with sour cream and smoke prork :) Like on this picture. 1 kilo saurkraut - rinse alittle right before adding so it's not too sour. 2 small cans of contadina tomatoe paste - mix both cans with enough water to cover entire pot of stuffed cabbage for cooking. 1. Remove core from the cabbage. Separate the leaves and boil them uncovered for 5 minutes or until soft enough to roll. Dry and reserve liquid. 2. Combine the meat, rice, spices, and eggs, mix well with your hands. Lay out a leaf of cabbage and center about 2 tablespoons of meat. Fold up sides and roll up ends to seal each roll. Continue with all the meat and cabbage. 3. To fill the pot, start with a layer of that chopped up cabbage mixed with sauerkraut. Then place the stuffed cabbage. Add another layer of chopped cabbage and sauerkraut on top of that, then another layer of stuffed cabbage. Keep going like this until you run out of stuffed cabbage, and add a final layer of chopped cabbage and sauerkraut on top. 4. Add the tomato saft, the smoked prok and the water to just cover the contents of the pot. Cook on simmer for one and half hour or until rice is tender.